Asha Thomas takes aim and fires for Cal. Photo courtesy of Cal Athletics. Seattle – Washington entered its first round Pac-12 Tournament matchup with just one conference win to its name. But the Huskies didn’t look the part of a No. 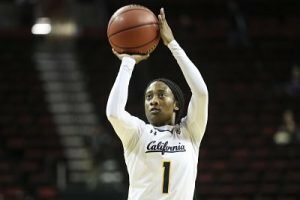 12 seed on Thursday, giving California all it could handle in an 71-68 loss to the Golden Bears. All-Pac-12 pick Amber Melgoza led all scorers with 24 points in the losing effort, while Asha Thomas had 19, and Mikayla Cowling and Jaelyn Brown each finished with 14 for the Golden Bears. After a scoreless first half, Kristine Anigwe finished with eight points and nine rebounds. 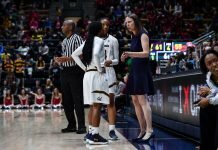 The Huskies used an 18-2 run in the third to take a six-point lead with just over two minutes to go, before Cal responded with the final five points of the quarter to cut the Washington advantage to one. The Golden Bears would stretch that run to 14 consecutive points in the opening minutes of the fourth (12 from Thomas), to take an eight-point lead they would hold the rest of the game. Washington stayed within two possessions until the final seconds, after forcing a jump ball on a missed Melgoza free throw, with the Huskies trailing by three. Melgoza’s 3-point attempt just before the buzzer fell short as the clock hit zero. Both teams benefitted from hot shooting early, each over 60 percent from the field after 10 minutes, but followed it with a second quarter in which they combined for just six made field goals as the Bears took a 35-30 lead into the break. In that first half, the Huskies were able to effectively limit the impact of Cal’s All-Pac-12 pick Anigwe, holding her scoreless. 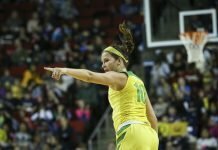 “I think what you call quite on the stat sheet is three people on her,” Gottlieb said. Though Washington’s season ends with just seven victories (and one in-conference), the Huskies are excited to get the offseason work underway. Cal will take on fourth-seed UCLA on Friday at 2:30 p.m. in the quarterfinals. The Bruins beat the Bears 82-46 on Dec. 31 in Berkeley, and 60-52 in Los Angeles on Jan. 19. The Golden Bears will try to use playing on back-to-back days to its advantage. Cal wins the season-series 3-0. The Bears beat the Huskies 69-60 in Seattle on Jan. 12, and 83-67 in their regular-season finale on Feb. 25 in Berkeley. The Golden Bears improved to 19-0 when leading at halftime. With three 3-pointers, Khayla Rooks matched a career-high.